This is the “20 x 20” presentation our President, Mark Besh, gave at the Volume #13 Pecha-Kucha Night in Detroit. It was about a non-profit we support, “Life Remodeled” (i.e. “Extreme Makeover: Home Edition 2.0”). [ The format is 20 slides automatically changing every 20 seconds! (no ‘do-overs’ or ‘dawdling’ allowed!) ]. Life Remodeled is a 501(c)3 non-profit that builds a house in 6 days, and “gives” it away to a deserving family on the seventh day—but it’s much more than that. Life Remodeled also recognizes that people in need of shelter also need essential “life skills.” In addition to building modest homes, Life Remodeled counsels all families in personal money management, careers, and psychological issues—for three years! [ NOTE: Their next ‘build’ (the only one for 2013), will be in the city proper of Detroit, Michigan (just north of Wayne State University), July 29th – August 4th. It will be much bigger than each of the previous 5 projects they have successfully completed in the past two years. They will be building 1 new house, renovating 24 houses, boarding up 250 vacant houses, and ‘beautifying’ the neighborhood in the surrounding 48 block area around the house—all with VOLUNTEERS! Click on the following link to read about their “plan” for this ‘project’, or to volunteer: http://liferemodeled.com/the-plan/ ]. Why do advertisers and marketers choose certain colors? Well, it’s no secret that different colors evoke different emotions in all of us, but which colors induce which emotions? Most notably, it is suggested that red stimulates the appetite. Most food franchises like McDonald’s, Pizza Hut, Wendy’s, KFC, Chipolte, and Popeye’s use red prominently in their branding. 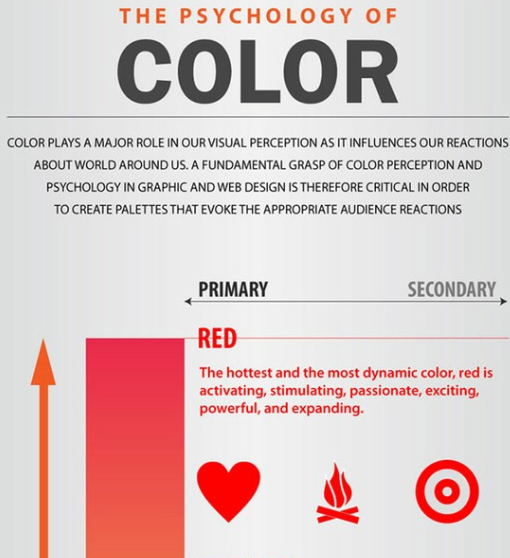 [ Note: That’s why Visual Impact Systems uses a bright red for its corporate color—to spur your ‘appetite’ for quality advertising and marketing services from a dynamic, stimulating, and passionate company! ]. In the ‘corporate’ world, a medium to dark blue is used because it ‘communicates’ stability and productivity. Many of the larger, established worldwide companies like IBM, Ford, HP, Intel, Samsung, Boeing, Unilever, Blue Cross/Blue Shield, GAP, American Express, Panasonic, Microsoft, and LinkedIn al use blue for their logos. (Could the more ‘corporate’ focus be why Facebook’s logo is blue?). [ Click on the following image for an infographic of the logo colors of the top 100 brands on the Internet (Source: ColourLovers) ]. In the food ‘world’, red colored foods are typically associated with sweetness—such as strawberry or cherry flavors. By contrast, yellow colored foods are associated with sour flavors like lemons. Green is perceived as tart in flavor, such as apples or limes. Darker colors such as black, blue or purple can actually be perceived as negative by consumers, because those colors are associated with spoiled or rotten foods. It has also been proved that the color of a food can actually influence the taste! Positive: Physical courage, strength, warmth, energy, basic survival, ‘fight or flight’, stimulation, masculinity, excitement. Positive: Spiritual awareness, containment, vision, luxury, authenticity, truth, quality. “Mere color, unspoiled by meaning, and unallied with definite form, can speak to the soul in a thousand different ways” [ Oscar Wilde ]. “LumaScapes” infographics, created by LumaPartners, are quickly becoming an important tool for advertising and marketing departments to use for understanding the digital media economy, and in selecting experienced ‘players’ in the various sectors. They give an overview of a certain sector, and also show the different ‘components’ within it. They have just released the “Marketing Technology” sector, and it focuses on the sales and marketing and web site areas. For us at Visual Impact Systems, it shows our prospects and clients the variety of services we provide, even though we don’t specifically tell them we do them ( these are just the myriad of things that we do to create a marketing campaign or develop a web site ). In the sales and marketing ‘sector’, the following are the major categories cited: Marketing Modeling; Integrated Marketing Management; Social Marketing Management; Email Optimization; Email Service Providers; Marketing Automation; Database Marketing; Visualization; DMPs; Marketing Data; and Data Warehouses. In the web site “personalization and optimization” ‘sub-sector’, the following are the major categories cited: SEO Platforms/Tools; Real-time Message/Offers; Landing Pages; AB/MV Testing; and Recommendation Systems. In the web site “e-commerce technology” ‘sub-sector’, the following are the major categories cited: Platform/Storefront; Social Referral; Merchandising; Payments; and M-commerce. In the web site “creation and management” ‘sub-sector’, the following are the major categories cited: WCM (Content Management Systems); Web Analytics; DAM; Online Video Players; Tag Management; Site Performance; Feedback/Surveys; Community; Social Content/Forums; Mobile Web; Social Login/Sharing; Translation; and Gamification. Visual Impact Systems provides many of these services in-house, ( integrated marketing campaigns, Internet marketing, and web sites ), and has partnered with experts to provide the other very specialized categories. 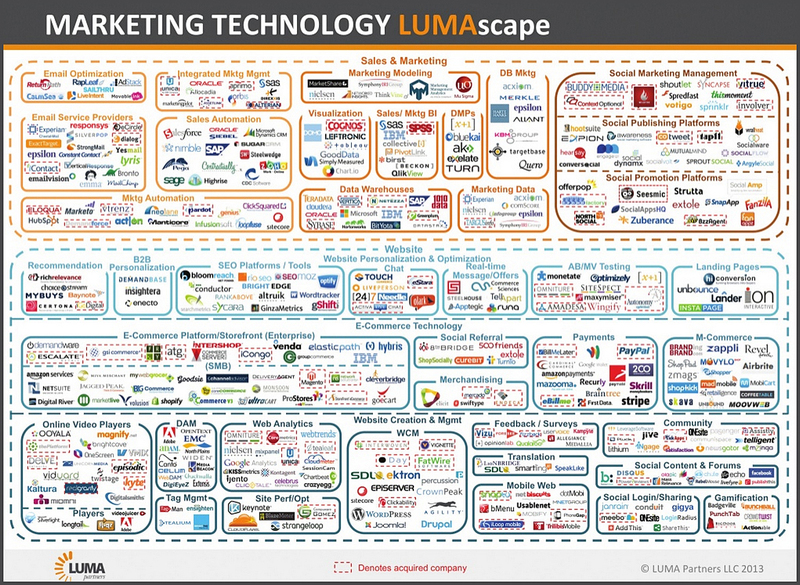 Below is the “Marketing Technology” LumaScape infographic. Click here, or on the image, to be taken to the LumaPartners site for more detail on this ‘sector’. Click on the following links to view the other “LumaScapes” they have produced ( Display; Search; Video; Mobile; Social; Commerce; Digital Capital; Gaming; and Strategic Buyer ). The answer to the LAST M.C. Escher ‘mirror puzzle’ image, the “Print Gallery,” was sent in by Jody Eidnes of the Great Lakes Conference in Canton, MI. (She and her family sent us three solutions!). To make it a little easier for you to get it set up properly, she removed the container to show the bottom of the cubes in their proper position (top of image is up in the photo). We hope y’all enjoyed this as much as we did! So, if you realize that you are ‘puzzled’ on how to get noticed online, we have the expertise to help! With over 23 years of experience in all of the media ‘outlets’ (“channels”), we can customize a ‘campaign’ that will be suited to your specific needs! We are looking for the LAST ‘solution’ for the M. C. Escher ‘mirror puzzle’. The ‘masterpiece’ that has not been solved yet is the Print Gallery (1956). So, who will be the FIRST to solve the LAST one? (Please send in a pic of the solution from the front, and a pic of the bootom of the cubes with the container removed). NOTE: If you are ‘puzzled’ on how to get noticed online, we can help! With over 23 years of experience in all of the media ‘outlets’ (“channels”), we can customize a ‘campaign’ suited to your specific needs! The answer to the M.C. Escher ‘mirror puzzle’ “Hand With Reflecting Sphere” image was sent in by Jody Eidnes of the Great Lakes Conference in Canton, MI. (Probably with a bit of help from her family). So, who will be the one to get the last puzzle solution? (The “Print Gallery“). You’ve got an entire weekend coming up to get it! We are looking for the last 2 ‘solutions’ for the M. C. Escher ‘mirror puzzle’. The ‘masterpieces’ that have not been solved are: Print Gallery (1956), and Hand with Reflecting Sphere (1935). The answer to the M.C. Escher ‘mirror puzzle’ “Reptiles” image was sent in by Jody Eidnes of the Great Lakes Conference in Canton, MI. To make it a little easier for you to get it set up properly, she removed the container to show the bottom of the cubes in their proper position (top of image is to the right in the photo). So, to all the other 20 people that received puzzles, we will post the next person’s answer as soon as we receive it. (Note: The images needing to be solved: “Print Gallery,” and “Hand with Reflecting Sphere”). Who will be the first to send in the next solution? We are looking for the last 3 ‘solutions’ for the M. C. Escher ‘mirror puzzle’. The ‘masterpieces’ that have not been solved are: Reptiles (1943), Print Gallery (1956), and Hand with Reflecting Sphere (1935). The answer to the M.C. Escher ‘mirror puzzle’ “Drawing Hands” image was sent in by David Kirvan of NZ Payroll Services in Southfield, MI. To make it a little easier for you to get it set up properly, we removed the container to show the bottom of the cubes in their proper position (top of image is up in the photo). So, for all the other 22 people that received puzzles, the ‘gauntlet’ has been “thrown down,” and we will post the next person’s answer as soon as we receive it. (Note: The images needing to be solved: “Reptiles,” “Print Gallery,” and “Hand with Reflecting Sphere”).